Distinguish between simple random sampling and stratified sampling. Describe how often random and stratified sampling give exactly the same result. 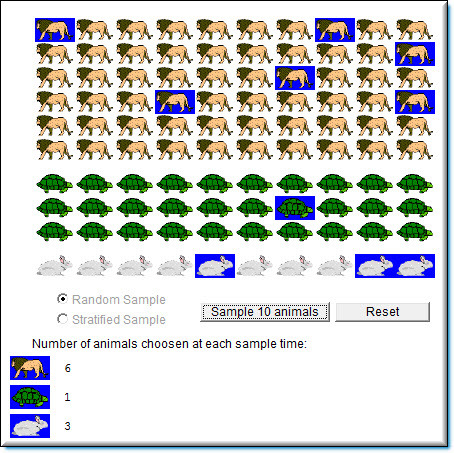 The sampling simulation uses a population of 100 animals: 60 lions, 30 turtles, 10 rabbits. : This option allows you to draw a sample of 10 animals at a time with each animal having an equal chance of being selected. : This option allows you to draw a sample of 10 animals at a time, with each number of animals from a group being proportional to their group’s size of the population. The number of animals chosen from each group when a sample is drawn is shown next to the picture of the animal. Begin by leaving the option selected. Click on the button, 10 animals will be selected out of the population. Note: The animals become highlighted in blue and a number count of each animal selected will be listed by each animal image. Each time you push the button, another sample will be drawn and the new tally will be shown on the right side of the previous sample. You should get different tally results for each animal as you select , however the computer may give you the same number drawn from an animal category every now and then. Click on the button, to clear the simulation. Click on the button a few times. Note: Your animals should become highlighted in blue and a number count should be listed by each animal image. As you get a new tally for every button, notice that the number of animals stays the same, but the animals selected are not always the same animals. 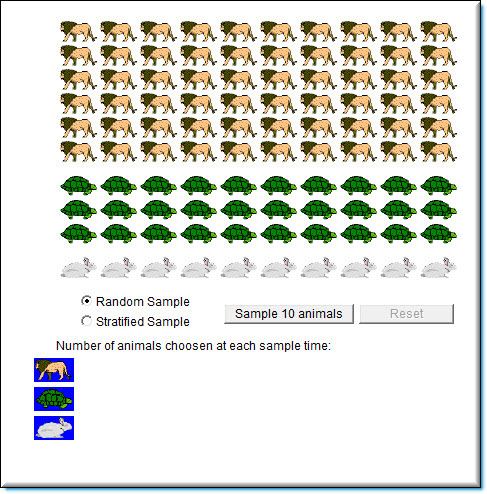 The opening screen of the sampling simulation displays all 100 animals in the population. You can select between a random sample and a stratified sample directly below the population and then generate a sample of ten animals. Below is an example of a random sample. Notice that animals selected are highlighted in the population and the total number of animals selected from each category is listed at the bottom of the simulation. We recommend you answer the questions even if you have to guess. Then use the simulation to help you verify your answers. After interacting with the simulation click the "Check Answer" button. To start, select Random or Stratified sample. Each time you click the "Sample 10 animals" the number sampled from each category is displayed.